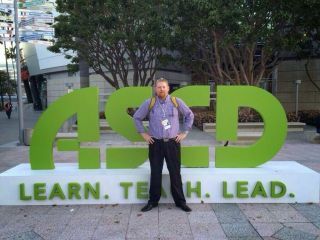 I recently returned from a trip to Los Angeles where I attended the annual ASCD conference. This is one of my favorite conferences of the year because of the diversity of the sessions offered. Everything from Edtech to Teacher Leadership, I usually come away with lots of ideas for going forward or things to think about. And this conference was no different. One was on the type of session offered. There was loads of great content. Again, ASCD does a great job of picking sessions. What I mean is the method of delivery. Many of the attendees are comfortable with the sit and get, lecture type, while few enjoy the participatory style. I experienced this first hand in one session I delivered that was very hands on. We were moving around, talking, exploring, and several people left, commenting, I heard later, they wanted to just have the information not participate in an activity. The session where this participatory type learning really benefited the attendees was the session about Edcamps. Kristen Swanson (an Edcamp Founder) designed a session that gave the Edcamp experience. We circled up chairs, suggested topics and then moved around the room so we could see what an Edcamp was like. She could have just as easily lectured for a hour on the model and how its been done. Rather, she gave everyone an experience they talked about for the rest of the conference and (I would bet) probably beyond. It’s no wonder we need a major redesign in the way we do school. Many educators are still comfortable with the idea they rather be talked at than talked with. If they like the lecture style, surely kids do too. We have to think about the way we offer sessions at conferences like ASCD. Participants need to be moving, thinking, talking to each other. I would like to see in session proposals how the session will be interactive and how the presenter will do follow-up with the participants. We have to think differently about content delivery, not just for students, but teachers as well. The other take away was conferences, ASCD included, need to better design the layout of rooms. Many of the rooms are set up for the convenience of the convention space where the conference is. They are lecture style, chairs in rows, sometimes impossible to move (and if you do move them, you best get them back in their neat and tidy rows.) These rooms are easy to set up and take down. Conferences need to push back and offer spaces that are more flexible and allow for movement. Imagine walking into a room to present a session at a national conference and there where chairs in the corner that allowed you to design your space. Or chairs on wheels that made it easy for small groups to form. If we want to encourage more participatory type sessions, we have to have flexible spaces that allow for more of this. Again, its all about thinking differently about how we do sessions and how we design spaces. What do you think? If you've been to a great conference session recently, what made it great? Have you seen any spaces at conferences that were flexible? What did they include? Leave your comments below.